Were you raised on poetry, the way I was? In the evenings, did your mother tuck you in, and sit on the edge of the bed with a poetry book, while your older brother leaned against her shoulder and pointing to pages? Did you fear the Crazy Old Vinegar Man and search for the North Wind when the moon crumbled? Did you learn about poet laureates before you could read, and memorize John Masefield’s Sea Fever? Not because you had to, but because the words haunted your dreams and you wanted them for your own? Have you kept journals of your favorite poems? Have you written your own poems, and squirreled them away, where only you and your children — if they are unlucky to be caught when you are nostalgic — hear your rambling words? But this day, when I was a bit older than nineteen, I gazed at my fifty-something professor, adoring his words; their words: Tennyson, Browning, Keats, Wordsworth. I wonder what he must have thought, when this star-struck co-ed begged to be added to his class? Did he go home that evening with a spring in his step, and a secret in his soul. If so, I never knew, my head was buried in the two-thousand page book, falling in love with poets long gone. Among the great poets is Robert Frost. “He’s a poet laureate too,” Mom told me. My grade-school eyes grew wide; I was surprised to learn there was more than one. And she read me The Pasture. Ten years later, I was in a cap and gown. My sister handed me a picture book filled with Robert Frost’s poems. “Thought you might enjoy this as you head for New England next year,” she wrote. The book came with me, and we stayed in New England. Mr. Frost’s words described my life in NH’s rural woods as I became a wife and mother. Twenty years later, it was my daughter’s turn to learn a poem. It was a chore for her, but a joy for me. Together we learned The Road Not Taken, and as we grew up together we have both come to know the wisdom of his words. On March 28, 2015, Robert Frost will be inducted into the New Hampshire Literary Hall of Fame at Southern New Hampshire University. He is one of four inspirational inaugural inductees, with Donald Hall, John Irving, and Grace Metalious. In two weeks, as each name is called, we will all remember that these four people chose their paths, and in doing so, left their legacy. 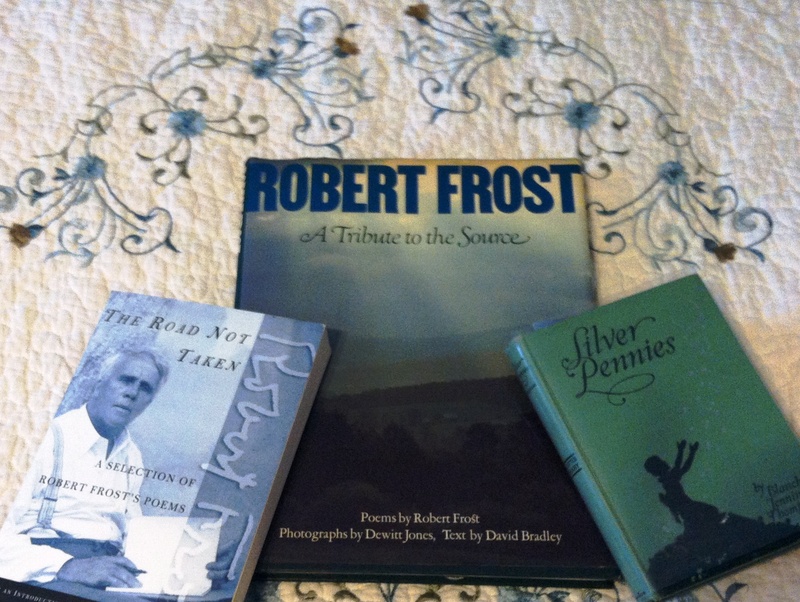 1) “The Road Not Taken” by Robert Frost; Robert Frost: A Tribute to the Source (page 91); compilation by Dewitt Jones and David Bradley; Holt, Rinehart and Winston, New York (1979). Dedicated to Eileen Byrne (October 27, 1962 – March 18, 1979). This entry was posted in Reading and Writing, Weekly Brief and tagged Donald Hall, Grace Metalious, Hall of Fame, John Irving, Literature, NH Arts, NH LIterary Hall of Fame, poetry, Robert Frost. Bookmark the permalink. ❤ Robert Frost and happy to hear about the induction. Also, Donald Hall. I heard him speak once–very inspiring. Great post! Thank you so much for stopping by. I’ve never had the opportunity to hear Donald Hall speak. That must have been wonderful!